Located on the Italian island of Sicily, Mount Etna is one of the most famous volcanoes in the world due to the fact that it frequently erupts and has a large number of eruption styles. The bleak lava wilderness around the summit of Etna is one of the most memorable landscapes Italy has to offer. The volcano’s height is constantly shifting, depending on whether eruptions are constructive or destructive, and over the last century it has ranged from 3263m to the present estimate of 3340m. Whatever its exact height, Etna is a substantial mountain, one of the world’s biggest active volcanoes, and on a clear day it can be seen from well over half of Sicily. Some of its eruptions have been disastrous: in 1169, 1329 and 1381 the lava reached the sea and in 1669 Catania was wrecked and its castle surrounded by molten rock. The Circumetnea railway line has been repeatedly ruptured by lava flows: nine people were killed on the edge of the main crater in 1979 and in 2001 military helicopters were called in to water-bomb blazing fires. This unpredictability means that it is no longer possible to get close to the main crater. An eruption in 1971 destroyed the observatory supposed to give warning of just such an event, and the volcano has been in an almost continual state of eruption since 1998, the most recent being in late 2002 when the resort of Piano Provenzana on the northern side was engulfed with lava. This entry was posted in Culture, Excursions, Experiences, History, Staff Recommendations and tagged #besthostelintaormina, #cheaphostels, #etna #volcano #taormina #giardini #naxos #hostel #cheap #best #view, giannihouse on August 3, 2015 by giannihouse. A highly recommended and easy detour either for the day, or to or from from Taormina is the nearby city of Siracusa, 2 hour south (by train direct, by bus a quick change in Catania) and a must visit for anyone on a tour of Sicily. Famed for it’s ancient Greek monument, the city, which dates back 2700 years, has a vast complex of Greek ruins, including the famed amphlitheatre which plays host to ancient Greek Tragedy plays in the summer months, as well as a spectacular cave complex called, Oriecchio di Dionisio (The Ear of Dionysius). Ledgend states that Dionysius used the cave as a prison for political dissidents, and by means of the perfect acoustics eavesdropped on the plans and secrets of his captives. It’s adviseable to hire a guide here as there is no information for the tourist whilst wandering the sites – so either you eaves drop on others who have been sensible enough to take a guide, or you need to have a very good gras of Greek history and a vivid imagiation! However the highlight of visiting Siracusa is the joy of wandering around Ortygia – a small headland which is connected to Siracusa by two bridges – with its maze of charming streets, where neighbours can almost stretch out and embrace their neighbours on an opposite balcony, where clothes flutter above to dry, a multitude of restaurants serving delicious Sicilian and seafood fare and a welcome stop for a gelato or granita await. All streets ultimately lead to Piazza del Duomo – with its beautiful cathederal a Baroque facade which hides inside a relatively modest church, the foundations of which date back to 5th Century BC, when it was built as a temple to the Godess Athena. Wander the seafront, where, in summer, you can enjoy swimming off the rocks from makeshift wooden platforms – the sea is crystalline and the locals are always ready for a chat. RECOMMENDED FOR APERITIVO: Stop by for aperitivo at Tinkite – an excellent bar serving really good food with aperitivo (3 Euro a plate) and a very nice easy going crowd. Get early to grab the deckchairs! RECOMMENDED FOR DINNER: Taverna Sveva for excellent fresh fish and seafood pasta and incredibly jolly staff! This entry was posted in Culture, Excursions, Experiences, Food + Drink, Miscellaneous, Staff Recommendations, Towns and tagged #Filmfestival, #Greektheatre, #Ortigia, #Siracusa, giannihouse, Sicily on July 10, 2015 by giannihouse. Last evening Gianni House organised a free Sundowners Sangria Aperitivo for our lovely guests. Sangria made with Sicilian wine plus Sicilian treats like olives, cheese and artisanal bread was served – that’s a fantastic start to our 2015 summer season! Thank you all for being part of it. It was a great evening which was followed by clubbing in one of the nearby discoteca. This entry was posted in Celebrations, Culture, Experiences, Food + Drink, Staff Recommendations, Taormina and tagged backpackers, backpackershostel, giannihouse, hostelintaormina, sangriaaperitivo on July 6, 2015 by giannihouse. Have you seen The Godfather movies yet? Many scenes throughout the epic trilogy were filmed in the Sicilian villages of Savoca and Forzà d’Agrò, that you can visit by booking an organised tour at reception or using public transport for the more intrepid. I [staff member of Gianni House :))] travelled to Savoca recently, to taste delicious Granita Limone at Bar Vitelli, where some of the most memorable scenes from “The Godfather” were shot [*Michael Corleone asked Apollonia’s father to meet his daughter*]. It’s a must for Godfather fans! Savoca village with it’s tiny streets is a pleasant place to hang out for the day and we highly recommend a visit to The Cappuccini Monastery which has an impressive collection of 32 ancient mummified monks, priests and advocates – some intact some not – in their catacombs, which date back to the 18th century. This entry was posted in Culture, Excursions, Experiences, History, Staff Recommendations, Towns and tagged bar vitello, cheap, cheap hostel in taormina, coppola, forda d'agrò, gianni house, giardini naxos, holidays, hostel, padrino, savoca, Sicily, staff, taormina, the godfather, Tours on July 4, 2015 by giannihouse. Situated at the foot of the magificent Mt Etna are a collection of small villages and towns which each have a unique feel – you can explore these either by car or on the cute little train that slowly makes it was around the base of the mountain – the Circumetnea train stops at two of the most impressive towns, which are Bronte (where Sicily’s famous pistachios are cultivated) and our favourite, Randazzo. The town is famed for the construction of most of its monuments from the dark volcanic lava-rock which is a feature of the landscape due to the eruptions of Etna. It is the town nearest the actual crater. If you are travelling by car you can easily combine Randazzo with a visit to the beautiful Alcantara Gorge. Ask us at reception for more information. This entry was posted in Excursions, Experiences, History, Staff Recommendations, Towns and tagged accomodation, cheap hostel in taormina, circumetnea, gianni house, randazzo, Tours, what to visit on June 28, 2015 by giannihouse. 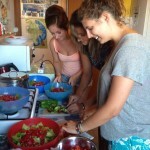 Would you like to discover the recipe for a great stay in Sicily? Come to Gianni House! This entry was posted in Food + Drink, Miscellaneous, Staff Recommendations and tagged #Giardini, #Naxos, #Taormina, cheaphostel, hostel, Sicily on October 1, 2014 by giannihouse.